We will host a free professional workshop, with breakout sessions, on April 26, 2019 to address STEM needs in our state. The event is open to local/state college students, college faculty, k-12 educators, and others who have an interest in minority educators and STEM education. We will have presentations from our workshop partners at the Arkansas Department of Education, the Arkansas Department of Higher Education, and others. We will have a finalized agenda of workshops in early 2019. 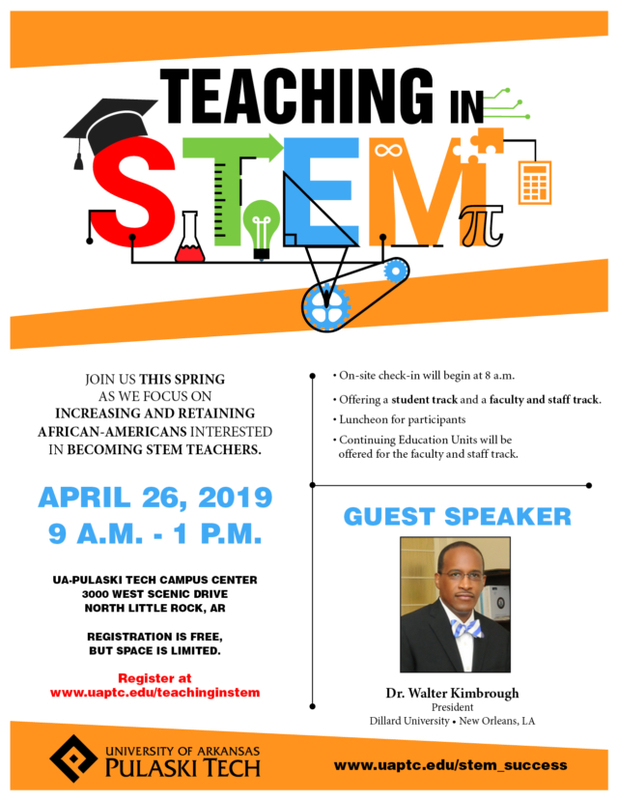 You may register for the conference at – www.uaptc.edu/stem_success or click on the link in the attached flyer. To increase the number of African American teachers entering the field of STEM. To increase the knowledge base of educators, faculty and others in the field, to help address this need. Encourage African American teachers in the field to stay in the classroom. Bring attention to the need to retain and graduate African American STEM students. Provide innovation methods to deliver STEM in the classroom. Increase cultural competency in the classroom. The keynote speaker for the luncheon will be Dr. Walter Kimbrough, President of Dillard University, and former President of Philander Smith College. Please contact me with any questions and share with your staff and contacts. We look forward to you attending!